My inspiration for this small quilt was the British weather. Mixed at the best of times, the weather we’ve had over the last few months has been truly horrible – very wet and windy leading to serious flooding and weeks of distress for many people. We have at last had some lovely sunny days and I have been able to enjoy walks beside the sea close to our home. In my quilt I have tried to illustrate these variations. I used a mixture of hand-dyed and commercial cotton fabrics. Embroidery and quilting are in cotton and rayon threads and other fibres include bamboo and wool. I love the variety of quilting designs and fibres that you have used to enhance the scene. Stunning, I just love it! 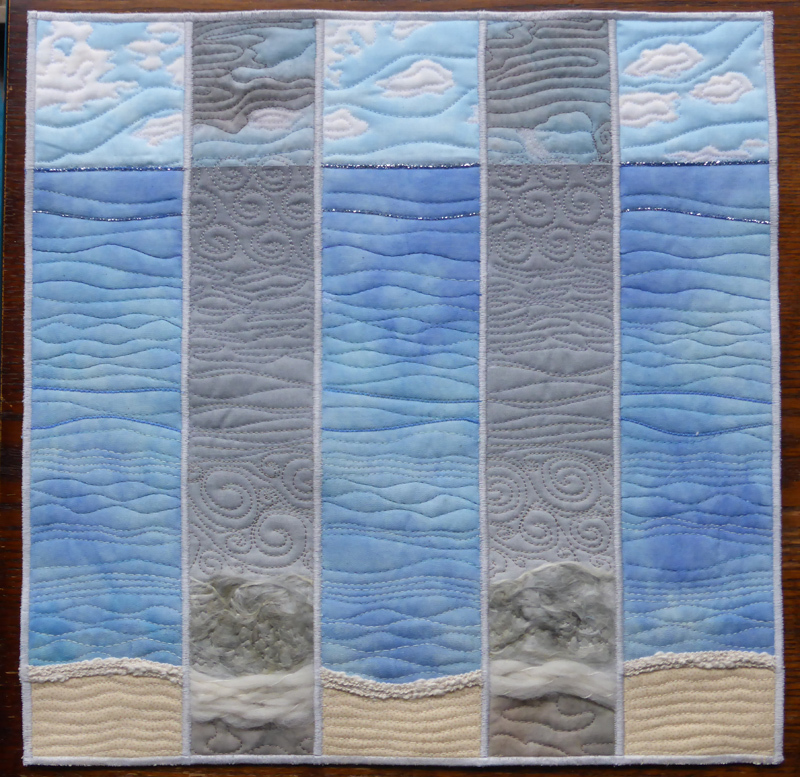 Helen, I particularly like how your quilting lines add to the contrast of the piece — calm and serene in good weather; swirly and turbulent in the storms. Well done! It is one of my favourite ! I like the atmosphere in this quilt .